Canberra’s suburbs are teeming with wildlife attracted to the seasonal resources in our gardens and street verges—resources that provide ‘fast food’ for animals a short flight (hop or crawl) from our nature reserves. 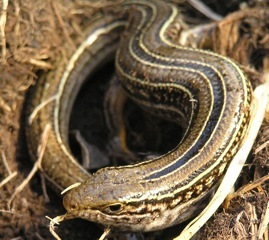 Encountering wildlife in your garden is always a thrill, particularly those species that make return visits every year. We have a clan of satin bowerbirds (Ptilonorhynchus violaceus), females and some young males (yet to develop that flash plumage) practicing their bower building skills and mimic routines. They move between the reserve and gardens feasting on goodies like fruit trees in Canberra backyards. A family of choughs (Corcorax melanorhamphos) plough our front yard a couple of times a year and then move on. We spotted this busy group in the nearby Mt Taylor reserve a few weeks ago under attack from the resident magpies. Gang Gang Cockatoos (Callocephalon fimbriatum) announce their arrival with their characteristic squeaky gate screech and have become more frequent visitors feasting on fruit of the liquid ambers at winter’s end and casuarina nuts. Our Parkcare Coordinator has been busy observing a pair of Red wattlebirds (Anthochaera carnunculata) raising a clutch of Common Koels (Eudynamys scolopacea) hatched in the interface bordering Mt Taylor. The exhausted surrogate parents have lost feathers and nearly starved themselves to death. Community volunteers have helped with surveys of koalas, quolls and other garden fossickers like bandicoots. Well-established community monitoring programs like Frogwatch and Waterwatch contribute useful species and water quality data as well as playing important roles in community education. Will Osborne is an enthusiastic field scientist who enjoys working with volunteers (and has long been involved as a trainer and participant in ACT Frogwatch). 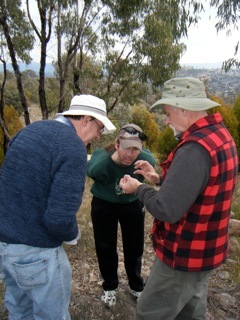 So far with Will’s guidance, the Parkcare group has learnt what reptile species are likely to be found on the mountain and surveyed about ten sites for Aprasia, adding to those surveyed by Will and his students from the University of Canberra. The Parkcare contribution includes a “before and after” survey of Aprasia habitat in Mt Taylor subject to a fuel hazard reduction burn in late August. While surveying for Aprasia, we are recording observations of other reptiles including many sightings of the Striped skink (Ctenotus robustus) and Boulenger’s skink (Morethia boulengeri). A lucky few were fortunate to witness a remarkable display of two male Eastern brown snakes (Pseudonaja textilis) entwined in combat mode, a truly amazing sight. The Aprasia survey will extend over another season and the field results shared with the Group. It seems from our experience that the key to involving local people in scientific surveys lies with the willingness of the researcher (or program manager) to thoughtfully educate, train and work alongside volunteers. By valuing the capacities of local people and enhancing their ecological literacy, it is not just a data gathering exercise but becomes a process of shared learning and discovery. Our new knowledge about reptiles can help inform management of the important rocky grassy habitat on Mt Taylor that supports these species. As a small group we can assist by restoring disturbed habitat and keeping the weeds out. The big stuff like managing recreational impacts (many informal tracks traverse the rocky slopes) and tackling wildlife theft will require the resources and management intervention of the Parks and Conservation Service (PCS). We see the reptile survey as a small step in a longer term project to draw together knowledge about the incredible diversity of the Mt Taylor reserve, hopefully with some hands-on help from experts like Will along the way. Parkcare members have prepared botanical and bird lists for the reserve but we know less about many other species especially the small mammals, insects and arachnids. We hope the knowledge we gather will evolve into a field guide or similar so the many visitors to the reserve can learn more about its hidden natural treasures. See for example: FitzGibbon, S. I. and Jones D. N. (2006) A community-based wildlife survey: the knowledge and attitudes of residents of suburban Brisbane, with a focus on bandicoots, Wildlife Research, 33(3), 233-241. Lunney, D. and Matthews, A. (2001) The contribution of the community to defining the distribution of a vulnerable species, the spotted-tailed quoll, Wildlife Research, 28(5), 537-545. Osborne, W.S. and F.V.C. McKergow. (1993). 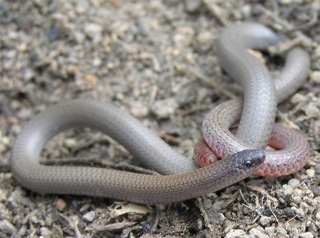 Distribution, population density and habitat of the Pink-tailed Legless Lizard Aprasia parapulchella in Canberra Nature Park, ACT. Page(s) 14-23. Technical Report 3, ACT Parks and Conservation Service, Canberra. Kathy Eyles is a PhD student with the ANU’s Fenner School of Environment and Society and is undertaking social research to explore the relationship between urban neighbours and nature reserves. Part of Kathy’s research involves interviewing people who live near nature reserves, people with interests in the planning and development of new suburbs adjoining nature reserves and managers of reserves including local groups and volunteers. Prior to embarking on this exciting research, Kathy has worked for the past 25 years as an environmental planner, policy analyst and community NRM facilitator, managing to experience a fair slice of Australia, living and working in five capital cities and a few rural towns. Kathy enjoys reading, her messy bush garden, raising chooks, walking the family sausage dog and seeing the world though the eyes of her nine year daughter. Kathy also does bit of volunteering at her daughter’s school and is a member of the Mt Taylor Parkcare Group in Canberra.